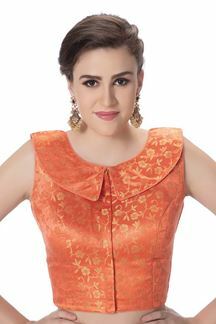 Captivating orange saree that will sweep you off the floor, this beauty features shining zari motifs at the top part all along the length of saree with the remaining portion enhanced with leaf shaped zari buttis for an awe-inspiring rich appeal! A paisley worked border along with zari borders and green piping complete the look with the adorning side and end of pallu border done in single gold border along with green piping for subtlety! 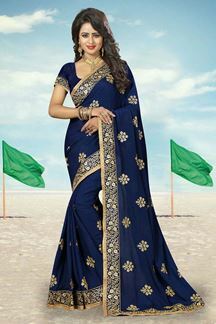 This saree is accompanied with matching fabric unstitched blouse. The blouse in the picture is for photo purpose only. Note: Color may slightly vary due to digital photography.